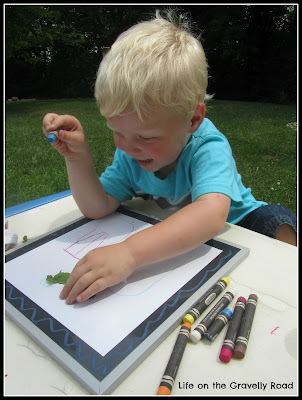 After an activity recently that included the kids drawing on white boards with dry erase markers, I was reminded why we get so much use out of our dry erase crayons. We've had them since back to school season last fall -- I found them on sale plus a coupon to make them very affordable. I'd replace our set at full price if need be though, I like them that much. They make so much less mess than dry erase markers! No marks all over hands and clothes. They are a little harder to wipe off the board -- usually need a wet paper towel -- but not a big deal. Whether we are working on letters or just drawing for fun, they are a nice change of pace from paper and regular crayons, especially for a little boy that enjoys "starting over" and otherwise uses as much paper as I let him. The other day we brought them outside to draw and ended up tracing leaves and other found objects. This post is being shared as part of this week's "Mama Loves" over at Pontifications of a Twin Mom. She is also running a giveaway with a favorite kids book so go check it out! (I was not compensated in any way for this post. Its just a product I enjoy, my opinion is my own.